BB Racings Australia Tristan Griffin had a tough opening round in Ipswich where he made a great fightback in the final which he was looking to build on over the weekend in Newcastle. Qualifying was meant to commence on Saturday morning but due to heavy rain in the area part of the circuit was under water and there was a two-hour delay before proceedings started. Due to the delays qualifying was cancelled and the heat starting positions were determined by the competitors timed practice position. Griffin came home nineteenth fastest in timed qualifying put himself inside the top twenty for the heat starts. Griffin started out of position nineteen and got a clean get away and was looking to make up positions quickly of the start. Griffin by half race distance had moved inside the top fifteen four spots up from his starting spot and looking on the move. Griffin got shuffled back positions in the back end of the race when looking to make up more spots and in the end come home where he started in position nineteen. Griffin again out of position nineteen for heat 2 got away cleanly on the opening lap and was looking to make his way forward with the adjustments made in his Energy BB Racing Australia entry. Trouble struck the young charger as he was involved in a pile up on the second lap at the first corner which took him out of heat 2 racing in a disappointing result putting him back for heat 3. Griffin had dropped back in the points order and was starting out of position twenty-five for the third heat with plenty of work to do. The Energy Kart Australia driver got a clean get away in the opening few laps stayed in his starting position before starting to get into his work in moving forward. In the back end of the race the BB Racing set up kart was working well and Griffin made his way back inside the top twenty crossing the line in position twenty before a few post-race penalties moved the energy kart driver moved up to position eighteen. Heat 4 came around and Griffin had moved up to position nineteen in the points and back inside the top twenty before starting heat 4. Griffin jumped away but again found trouble on the opening late where he was run of the circuit in a racing incident causing the BB Racing Australia pilot to have another non finishing result putting him down the order for the final with plenty of work to do. Griffin was out of position twenty-three for the start of the final. 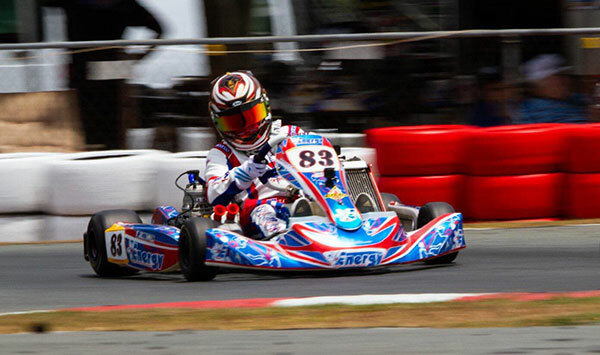 Griffin was again involved in accident where he was going backwards facing the wrong way over the start line in spectacular fashion which caused another DNF for the Energy Kart Australia factory driver in a weekend to forget. Mechanic and BB Racing Australia’s Adam Bailey told it was a weekend to forget but took his pace in at certain stages throughout the weekend away as a positive. “It was a weekend where everything went wrong and it just wasn’t our weekend” noted Bailey. Having no qualifying hurt us and once you’re in the midfield it can be so easy for things to go wrong as they did for us this weekend. To Tristan’s credit he never gave up and his pace in the final was matching some of the top five guys and that’s a positive we can take to the next round at Monarto”.